1) The easiest way to turn source list into a mandatory requirement is to set this in customizing per plant. Go to IMG > Materials Management > Purchasing > Source List > Define source List at Plant Level. In this transaction set the indicator for the plant that is going to be moved under the tighter procurement regime. Alternatively, you can set the source list requirement in the material master’s Purchasing tab. The advantage of this is that you only put certain materials under tight procurement rules. 2) Now it is important that all inforecords and contracts are up-to-date: update inforecords and contracts where you can and remove any obsolete ones. This is not a one time exercise: when using mandatory source lists it is an absolute condition that inforecords, contracts and subsequently the source list itself is up-to-date at all times. Outdated and incorrect source lists will lead to frustration where purchase orders cannot be created and procurement lead time will increase. Embed this new responsibility properly to a master data person in the procurement department. 3) Now that all inforecords and contracts are up-to-date you can mass create source lists using transaction ME05. In the opening screen of the transaction enter the data for the materials for which you wish to create a source list (If you have multiple sources for a material do not set the MRP indicator. Only one source with MRP indicator makes sense.). No worries, no actual source lists are created when you execute the execution button (F8). Actual creation of source lists is done when you save in the next screen of the report results. When you are in the report overview you also set a fixed or blocked vendor by selecting lines and using the menu. If you are not happy running a mass transaction you can still use ME01 for material-by-material source list creation. 4) Last thing is to check that authorization for end-users is tight enough. Users should only be able to procure for their own purchasing organization, purchasing group and plant. If this is not the case, you run the risk of material being procured from the correct vendor but by the wrong people. Taking care of the above steps should make your organization rogue-buying proof from a SAP perspective. Unfortunately SAP cannot prevent users from printing their own Purchase Orders in MS Word and faxing this to the vendor or ordering on-line. This entry was posted in MM and tagged authorizations, MM on January 6, 2009 by mensenjh. My clients wants to have multiple source lists lines for a particular material with MRP relevance ‘2’. These source list items are different Purchasing Scheduling Agreements (PSA) with account assignment M, which pertains to customer scheduling agreements (CSA). The idea is that whenever there are schedules lines written in the CSA, the demand created should be translated into the corresponding PSA when MRP is run. I want to know if this is possible. In my prototype I am not able to create schedule lines in PSA. 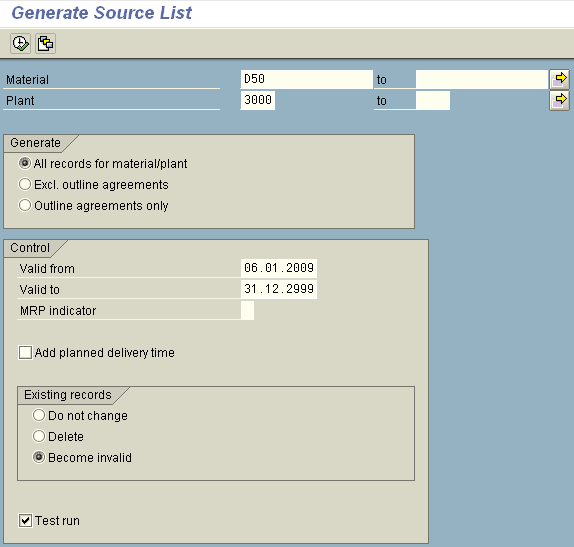 I have been able to make the scenario work in SAP. The problem was with the choice of item category in the CSA which was not picking up the correct line item category. Thanks for your inputs anyway. We have been having an issue with MRP generated purchase reqs. The vendor from the source list is correct (fixed vendor) in the purchase req, but the info record is not getting assigned and therefore the purchase price from the info record is not in the purchase req. Only one valid info record exists for the material/plant/vendor combination in our system, so I am not sure why it is not getting assigned properly. we have two purchase organizations assigned to one plant. we want procure same material from single vendor from two purchase organizations in different volumes. Purchase organizations : PRG1 & PRG2. But from PRG1 : 300 nos & from PRG2 : 700 nos. delivery schedules created on PRG1 are 300 & on PRG2 are 700 nos. how to achieve this through source list. Hi Vijay, try using the Quota Arrangement (MEQ1), it is one level deeper than source list. This may solve your problem.